You can now avail the newest SIM only plan from Sun Cellular that gives you unlimited calls and text plus text to other network for only 250 pesos monthly charge. This special Sapphire SIM is part of Sun and Automatic Centre 65th anniversary special offer. Subscribing to this Sun Plan 250 lets you enjoy 25% saving than availing to prepaid call and text promos. This plan only includes a postpaid SIM card from Sun and the network service is bundled on it. If you’re looking to avail a plan the includes a smartphone and a gadget then you can try their available phones under Sun Plan 600 . This is a good start to open an account on Sun Postpaid as a stepping-stone for your next plan application. Another good service that you can benefit with Sun Cellular is their Power Up Add-On for existing subscriber where you can enjoy additional internet package on your current plan. 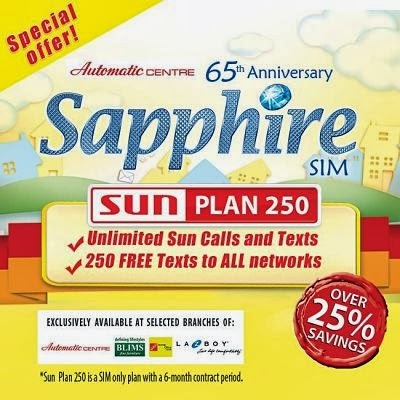 You can avail this special Sun Sapphire SIM Plan 250 at selected branches of Automatic Centre, Blims Fine Furniture, Sogo Home & Office, and La-Z-Boy. For more details you can call Sun hotline and for postpaid application requirements you can check out how to apply.